We made it to Ohio after a very long day in the car. Eager to get out to run around it was nice to drop in and surprise Grandma and Hoppa. Hoppa's garage is big. It's full of toys for all. Toys for kids and toys for Grandpas. 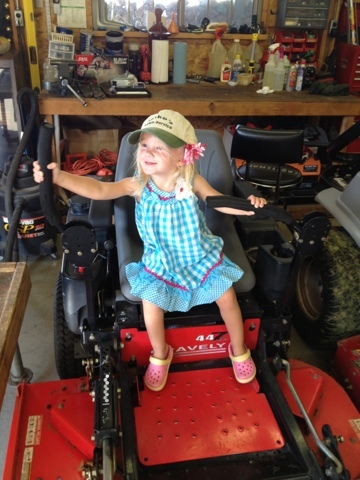 Adelynn absolutely loves Hoppa's mowers. 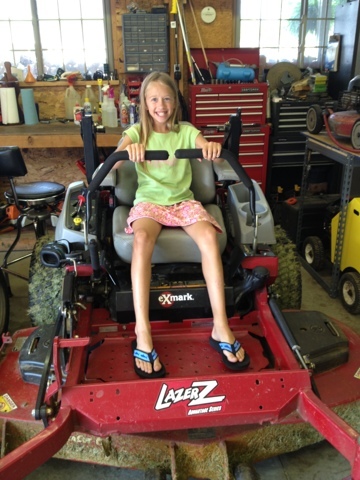 She had a great time trying out each of his mowers. Even Olivia took part in the fun too. 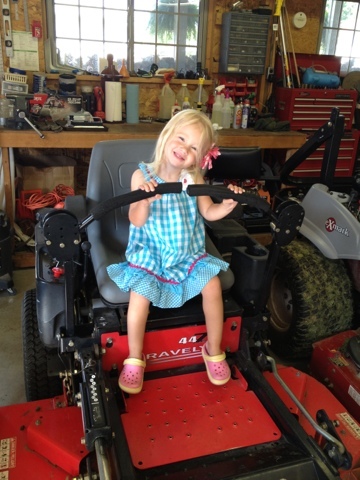 I still can't get over how focused Addie was with the mowers. She loved everything about them. The size, color, smell, all the buttons, just everything. She kept asking for Hoppa to turn them on but Hoppa told her that they were too tired and needed to rest after working hard all day long. At least I know what we can do this week. Sit on the mowers and pretend to drive them around.